Hi! I am Kristin. 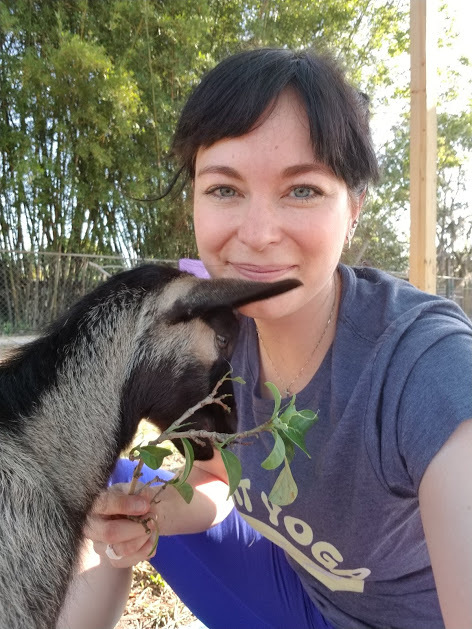 I have small (big) obsessions with desserts, goats, goats and yoga together, the Giant Squid, sunsets and sunrises, flamingos, watermelon, cafeteria food, shoes, 90’s music, thrifting, reading, sweet tea, and Jesus… and not necessarily in that order. I believe that God sent His son to die for my sins and I plan on making myself worth that sacrifice for the rest of my life. He has blessed me more than I deserve. I am married, and together, we have two rad little boys, aged 8 and 6, and a 10 year old special needs dog. They all keep me very busy. By day, I am a Mama first, and secondly, a preschool teacher’s assistant. I am so thankful! My desire to bake came in my early adulthood, where I found myself in a strange spot in life. There were times I felt alone and lacking in purpose or talent (truth be told, I still am lacking in talent!) and dealing with my ever-present anxiety and depression. I began baking to give myself something to do in my free time, to learn something new, to ease my woes (you wouldn’t believe how carefully measuring out flour and sugar, cracking eggs and turning simple ingredients into something wonderful can take your mind off your troubles) and to appease my sweet tooth. I never thought that decision would give me more overall life confidence. Fast forward to present times – I still find time for my baking; it’s my passion. My boys and I love to bake and cook together. I’ve found myself learning more and more about my health and how I can use healthy ingredients to help heal my chronic illness, anxiety and depression. My blog has taken a little bit of a turn, as I learn more about food and its healing powers. I still do desserts though. That won’t ever change. Good for you! Good luck with your blog…I’m looking forward to some good recipes and ideas!! Thank you Aubrey! That means a lot to me!